Toy Guru has posted a new video showcasing some upcoming products. In the video, he previews the packaging and a few figures for the upcoming Watchmen toys. 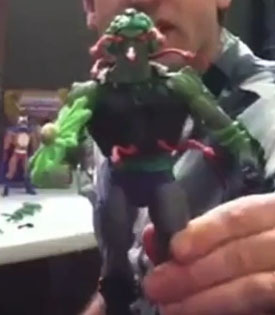 He also shows off the upcoming Masters of the Universe Classics Snake Face. Check out the video below. All I'm seeing is green, yellow, and brown poop in the video. Did they have Fearless Photog film this? 1 figure every 2 months? Uggh. I'm going to forget and miss out. Oh well. I only want Dr. Manhattan, but my 13" live-action figure from DC Direct will have to suffice. Gas gun, seriously? I'm guessing this guy never read the comics. He obviously means gas-powered grappling gun. That was the crappiest HD video I have seen yet. Watching that in anything below 1080p(Which is what I was watching) would be unwatchable. Could not tell what he was doing with snakeface because the quality of the details were very unclear with the video. Maybe Matty really is low on funds since they are obviously using a 90's web cam to film this. Oh by the way we plan for this line to last many years to come....sorry but due to lack of subs these will be the only figures produced ever just these 2 I have in my hands.